Experts say that at least two serves of fruit per day is required as part of a healthy diet. You don't have to stick to boring apples, oranges and pears when our climate is perfect for growing delicious exotic fruits. 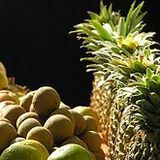 The hardy pineapple is the easiest fruit to grow. Just remove the top from a store bought pineapple and plant it in the ground or in a pot. They do, however, take a longer to fruit – about twenty four months. Synsepalum dulcificum is the scientific name for a shrub that produces a berry known as miracle fruit. The fruits molecules bind to the tongue and make sour things taste sweet for about two hours after eating. Miracle fruit is tricky to cultivate but it is a lot of fun, and is a favourite of diabetics. Miracle fruit seedlings must be planted in acidic soil (add peat moss to your backyard soil) and must be watered with rain water or bottled water, not tap water. Fruit trees can be grown in the smallest of backyards. Grafted trees are better than seedlings as they don't grow as large and start producing fruit more quickly. To encourage growth, weed the area around the roots regularly and prune any dead branches and leaves from the tree. Frequent pruning is especially important if space is limited. Guava is a sweet, fragrant tropical fruit that grows to the size of an apple. The guava tree is a hardy, compact plant with white flowers. There are more than a hundred different varieties of guava – the yellow cherry is the sweetest, while the strawberry guava is best suited to small gardens. Jaboticaba is a tropical purplish-black grape from Brazil. They are easy to grow and fairly low maintenance, as the fruit grows on internal branches hidden from birds and fruit flies, although they do need to be pruned hard to prevent overgrowing. For backyards that can't support the smallest of trees, vines are a good alternative. All they require is vertical support – you can even use the side of your house. Passionfruit thrives in this climate and grows rapidly, but does require some attention. They grow best in an area that receives lots of sunlight and is protected from wind and rain. The vine has a delicate roots system so you will need to keep the soil well watered and fed with a natural fertiliser or compost. To plant passionfruit, simply purchase a fresh passion fruit, remove about half a dozen seeds and plant them. They will begin to germinate in about twenty days. There's an old farming expression that goes, live as though you'll die tomorrow, farm as though you'll live forever. Cultivating an exotic fruit garden is a long term project but your patience and efforts will be rewarded. Why? The payoff is delicious!